Sharab el Toot is one of Lebanon’s most traditional drinks; a thirst quencher served to guests on hot summer afternoons. 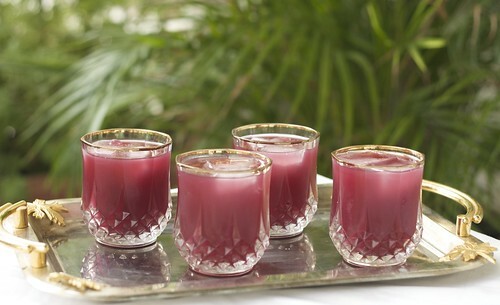 It is an exotic, revitalizing, wholesome drink that is sweet yet tangy and is rich with antioxidants. At the turn of the century, Lebanon was known for its high-quality silk industry. Bestowed with ideal climate and a fertile soil, Mulberries were planted everywhere in Lebanon and mulberry production flourished. 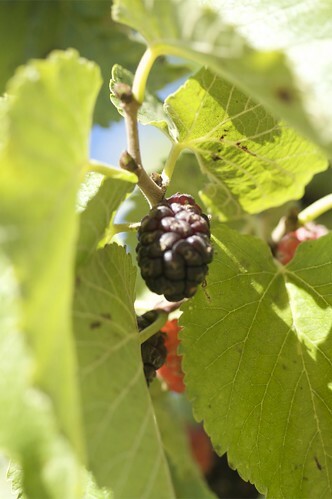 The leaves of the mulberry were used to cultivate silk worms and at harvest would be separated from the mother fruit. 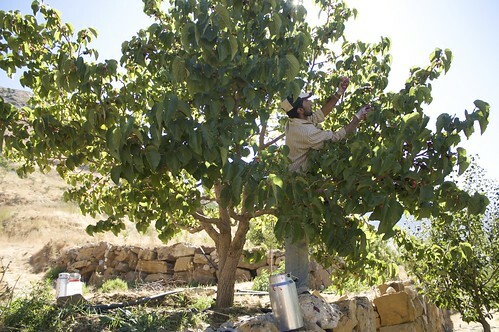 As the mulberry fruit has a short life span, Sharab El Toot was an efficient way of preserving it. Sharab el toot is served diluted with ice water. 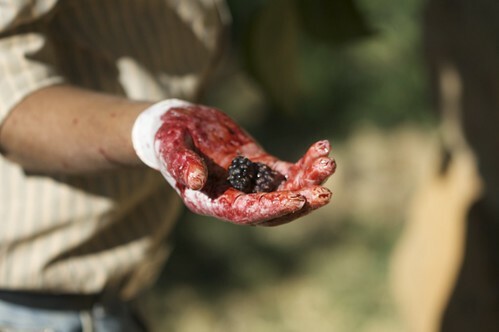 It is also common to use mulberries to make ice cream and Jam. Sharab el toot is heavenly drizzled atop ice cream. We harvested about 8kg of mulberries. From that we got 4 litres of juice or about 16 cups. Because we are making a syrup we added 2x the amount of sugar, unlike when making jam where the ratio is 1 to 1. This came out to be around 34 cups or 8kg of sugar. This yielded 8 bottles of 1 liter volume or 8 litres of Sharab el toot. Select fully ripe fresh black mulberries, discarding the red berries as they render the syrup too sour. Wear rubber gloves as the juice stains the hands. Place a food mill over an enamel or earthenware pot, fill with berries and begin turning it to extract the juice. Alternatively, put the berries in a muslin bag and press the juice from them into an enamel or earthenware pot. This will leave the seeds and skins, or residue. Discard. Once you’ve extracted the juice, run it through a sieve to remove any remaining large chunks of the fruit. P.S. We did not throw away this bit, but added some of the juice, some sugar and made it into jam. Turned out very well. Now the juice should be very smooth. Measure the juice. For every cup of juice add two cups of sugar. Stir well. Using only a wooden spoon. Boil over a high fire until somewhat thickened. Remove the froth that develops. Juice should be cooked in a glass or enamelware saucepan to avoid discoloration to the syrup. Remember to continuously stir, so not to let the syrup burn or pour out. That would be a terrible mess to have. Bottle when tepid and seal when thoroughly cold. Open bottles of syrup should be stored in the refrigerator. Use a tablespoon of syrup per glass of ice water when preparing the beverage. Increase according to taste. Yum! I’ll have to try it, we have a mulberry tree in our bkcyaard. We have to trim ours down though because a branch is over the neighbors driveway and he complains that they mess up his space. Maybe I should make him a pie! Just brilliant. Now I know what to do with the oodles of mulberries that my Man Friday will get when the season begins. Very very refreshing…a beautiful post & gorgeous pictures! I love that you tood pics to explain. This drink looks so good. I haven’t heard about it before. Deeba- I can’t wait for you to make this into a baking post! Will be delicious I know! Helene- Thanks. It’s an old process from back in early 1900’s when we were under french mandate. Oh Bethany, you make me crave for the mulberries. I wish they were in season here! Gorgeous photos! I love the pictures! I am so happy that someone has captured this process in its entirety. Also, I am so happy that I’ve discovered yet another Lebanese food blogger. I don’t have to feel so alone in this world any more hehe. Hello Fouad and thanks for stopping by! The pictures were taken in Lebanon at our mountain home in Ayoun (just above Baskinta or directly below Sannine.) I love sharab el tout and it was lovely being able to take snaps of the whole process. Karnoob is a pod from which molasses are made. Toot are mulberries. my mom loves this stuff, but can only get it when she visits family in lebanon. where can i get it for her? she likes both the kharnoob and toot but i cant seem to find anyone that sells it already made. any help would be appreciated. The mulberry syrup does look absolutely refreshing. The pictures are fantastic.